Your eyes and skin will thank you. Some signs of dehydration include, dry skin, feeling dizzy, headache, feeling tired, sunken eyes, dry mouth and dry eyes. Also if your urine is dark and cloudy, this could be a sign of dehydration. So here are my top 5 tips for staying hydrated in the winter. Your eyes, skin and your whole body will thank you! Water leaves the body through exhalation, perspiration and urination. If you are exercising in the dry winter air, and sweating you will need to drink more water. Also make sure your urine is pale and plentiful. If it is dark and scant you need more fluids. Indoor air is extremely dry in the winter. Place a humidifier in your office and bedroom. It will keep you skin and eyes from feeling dry. Avoid salty, processed foods that rob your body of fluids. Eat fruit and veggies which have a high natural water content. I keep a cup of tea on my desk all day long. My favorites are camomile and ginger. Put a splash of apple cider vinegar in for extra flavor and an added health boost. Sometimes it can be hard to stomach a bottle of water when it’s cold outside. 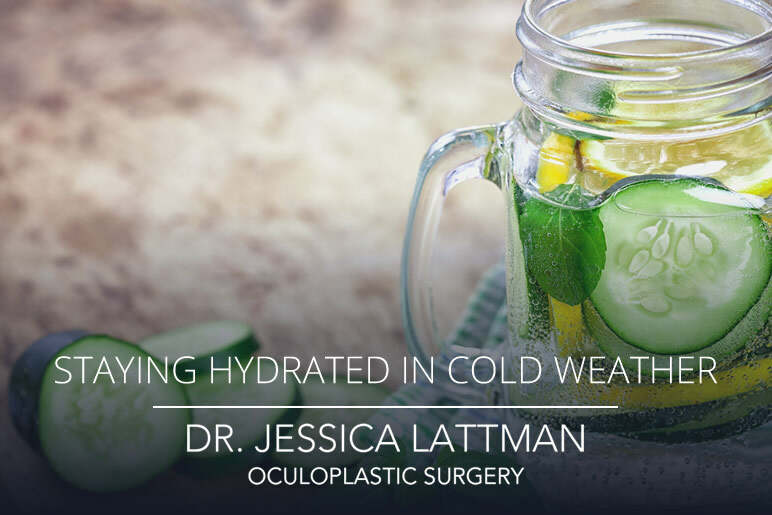 Try infusing your water with cucumber or orange slices. This adds a subtle flavor and makes drinking easier.